We all know the story of Jonah and his fleeing from the will and command of God. Jonah was commanded to preach to Nineveh and instead he headed out to the western end of the Mediterranean Sea. God caused a storm to come up and the ship was in danger of going down. The mariners, in fear of their lives prayed to their gods and lightened the ship of it's cargo. Old Jonah stayed fast asleep in the bottom of the ship (probably worn out from running from God to the point of sheer exhaustion). The crew cast lots and the lot fell on Jonah and he revealed to them the cause of the storm. Jonah knew the cause of the storm and he knew how to stop it. Jonah told them to throw him overboard into the sea and the storm would cease. Think about it a minute. If you went back and read from the time Jonah fled until he was cast overboard you would see he would not pray. The mariners prayed to their gods and then later to the Lord to find another way other than casting Jonah into the sea. The captain even implored Jonah to plead with his God that they might be spared but the scriptures do not mention that Jonah prayed. Have you ever thought that Jonah was ready to die in the sea rather than go to Nineveh? Is it not likely that God would have calmed the sea if Jonah had repented and asked for the lives of the people to be spared and surrendered to go to Nineveh? That was all that God wanted from Jonah in the first place. Go to Nineveh and preach that they could have the opportunity of salvation brought to them. Out of desperation the mariners cast Jonah overboard and while he was preparing to fill his lungs with water and enter into the release of death the totally unexpected happened. He wound up on a whale's (Matt. 12:40) menu. Dying was one thing but this was something else altogether. Jonah was not prepared for something as terrifying as this. Imagine the blackness, disgusting slime and stench of being bathed in the digestive juices of a whale. 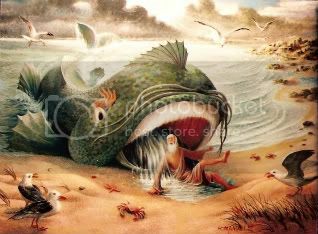 This brings us to Jonah 2:1; "Then Jonah prayed unto the LORD his God out of the fish's belly".While the story of Jonah is the account of an Old Testament prophet it is also a story that has application to Christians. Even more than we might care to admit. Have you ever noticed how the deeper in trouble a person gets the more he or she will try to reach out to God? Every one of us has a breaking point. Jonah's was in the guts of a whale at the bottom of the ocean in a state of awareness where unconsciousness would not come. David reached his with the sickness and death of his ill begotten son through Bathsheba (2 Sam. 12:15-17). Peter had his when his eyes looked into the eyes of Jesus as the sounds of the rooster faded away for the 3rd time (Luke 22:61-62). Jacob found his when he was faced with Laban behind and his brother and 400 armed men before him (Gen. 31:52-32:30). With no place to go and no one else to turn to he wound up grabbing the feet of the Lord and hanging on. How many times have God's children faced distressing and hopeless circumstances because of disobedience to God. Is it not likely that much anguish could be spared us if we would surrender to God's will at all times and not just when calamity comes? In thinking on these things my mind goes to the story of Daniel in the lion's den. He was there because of prayer to God yet I don't think Daniel ever had a more peaceful and restful night than that night. Daniel didn't wait for troubles to bring him to obedience. His relationship with God was a constant reality. The 3 Hebrew Children in the furnace. They weren't praying for deliverance in the furnace. Why? They were "prayed up" and God was in the fire with them. They lived a life of fellowship and obedience. Paul and Silas were in prison but they weren't defeated. They were praising God and singing songs. They were joyous in their persecution because they weren't stormy weather Christians. These were men who served God and prayed often. They fellowshipped daily with God and were obedient to His call on their lives. Worship, prayer and obedient service to God may not stop troubles from coming but they will give us a peace in the storm. Worship, prayer and obedience may not keep us from trouble but they will keep us out of the whale's belly. Because I stopped to pray. Click here to read more of Thomas Kittrell's poetry.